Keahuolū is situated in the transition zone between these two contrasting environmental districts, and is immediately north of Kailua Bay, a center of both political and economic activities since before Western contact. Several general settlement pattern models have been generated by researchers that generally divide up the region into five basic environmental zones: the Shoreline, Kula, Kaluʻulu, ʻApaʻa and ʻAmaʻu. Habitation was concentrated along the shoreline and lowland slopes, and informal fields were probably situated in the Kula and higher elevations, areas with higher rainfall. The Shoreline zone extends, typically, from the high-tide line inland a few hundred feet. In Kailua this is the area from the shore to approximately Aliʻi Drive. In this zone, permanent settlement began in Kona c. AD 1000-1200. Several large and densely populated royal centers were situated at several locations along the shoreline between Kailua and Honaunau. The Kaluʻulu is zone is referred to as the breadfruit zone. Early explorers described this zone as breadfruit with sweet potatoes and wauke (paper mulberry) underneath; it may have been perhaps one-half mile wide. Here walled fields occur at the 600-800-foot elevation, which may be start of this breadfruit zone in this area. The ʻApaʻa zone is described as a dryland taro and sweet potato zone (1,000-foot elevation and extended to the 2,500-foot elevation.) In historic accounts it is described as an area divided by low stone and earth walls into cleared rectangular fields in which sweet potato and dryland taro were planted. On the edges of the walls, sugarcane and ti were planted. A fishing village with a canoe landing was at Pāwai Bay. Makaʻeo (later (July 10, 1949) developed into the Kailua Airport (commercial aviation ended there July 1, 1970)) had a large cocoanut grove, with a coastal trail running through it connecting Kailua Village to the Māmalahoa Trail. The Kuakini Wall (1830-1844,) built to keep the free-ranging livestock out of the coastal settlements and gardens, extends from Kahaluʻu Bay to the southern portion of Keahuolu (with an average distance of about 1 ½ miles from the coastline.) It goes to, but not through, Keahuolū at its northern terminus. The ahupuaʻa of Keahuolū was awarded to Analeʻa Keohokālole ((c. 1816-1869) mother of King Kalākaua and Queen Liliʻuokalani) during the Māhele of 1848. Two walled houselots in Keahuolū had been held by Keohokālole’s ancestors “from very ancient times”. Keohokālole sold portions of her 15,000-20,000-acre grant to the government and other parties, with the balance being transferred to her heir, Liliʻuokalani. In her Deed of Trust dated December 2, 1909, which was later amended in 1911, Queen Lili‘uokalani entrusted her estate to provide for orphan and destitute children in the Hawaiian Islands, with preference for Hawaiian children. Her legacy is perpetuated through the Queen Liliʻuokalani Children’s Center. The image shows the makai portion of Keahuolu over Google Earth with some sites and place names added. In addition, I have added other related images in a folder of like name in the Photos section on my Facebook and Google+ pages. Interisland air travel was initiated in Hawaiʻi on November 11, 1929, by Stanley Kennedy, a WWI aviator who acquired two Sikorsky S-38 Amphibian aircraft and initiated direct service from Honolulu to Hilo (3 times a week) via Maʻalaea, Maui, and to Port Allen, Kauaʻi (2 times a week). Later, service was added to Molokaʻi. For a number of years, Kailua-Kona was only serviced by seaplanes. Then (after clearing an area of rocks the week before,) on August 21, 1935, Alfred W Smith landed his single-seated monoplane about a mile north of Kailua, the first airplane ground landing ever made in Kona. By the late-1930s, there was a public push to provide an airport at Kailua, Kona. An area parallel to the beach, previously used for small aircraft operations, and known as Kailua Airstrip, was determined to be the only suitable area in the vicinity. It was located about 1½-miles northwest of the Kona Inn. “It is believed that the proposed airport would result in a great increase in tourist interest in the area and also in the development of vacation homes for residents of Honolulu,” stated a Department of Public Works report. In late-1940, applications were prepared and processed under the provisions of the 1940 National Airport Act. The next year funds were allotted, but construction never started. Finally, in 1944 the Post War Planning Division of the Territorial Public Works Department proposed proceeding with the airport when the war was over. Surveys were made and plans prepared by the Department of Public Works, and in May 1948 bids were opened for construction of a runway 100-feet wide by 3,500-feet long, an aircraft parking mat and an access road connecting the main road through the village of Kailua. Work was started June 10, 1948. Due to the multiple ‘Kailua’ names for various items, including airports (there was another private airport at Kailua, Oʻahu,) on February 7, 1949 the airport was named Kona Airport. Hawaiian Airlines President Stan Kennedy announced that additional weekend flights would be made by his airline on the Kona Coaster every Friday afternoon from Honolulu and returning every Sunday afternoon. “Kona will become, now more than ever, a must for the tourist as well as for local travel,” Kennedy said. Hawaiian Airlines was the first commercial plane to arrive at the airport from Honolulu via Molokai at 11:30 am bringing a full load of passengers and the first direct air mail from Oahu. It took off at noon bound for Honolulu with passengers and air mail. Over the next few years the facility was expanded and the runway lengthened. 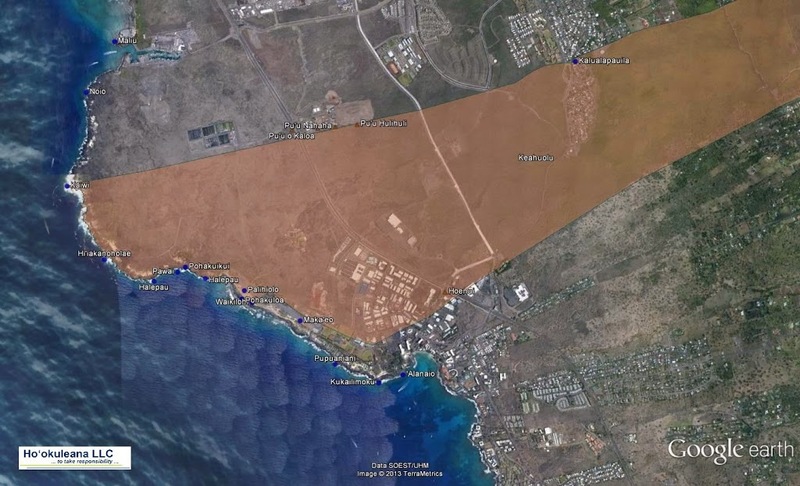 However, the location of the airport, with planes flying over Kailua-Kona and nearby residences, started to raise concerns – especially with the increasing number of flights and the need for further expansion with a longer runway to accommodate larger aircraft. Less than 10-years after it opened, in 1957, there were discussions and planning for the relocation of the airport. Part of the plan was to sell the old airport site for the development of a tourist resort, in order to fund construction of a new airport to replace those facilities. However, in the interim, in 1966, the runway was lengthened as a stop gap measure to accommodate the growing size of the interisland carriers’ planes. On June 30, 1970, Kona Airport was closed and all operations were moved to the new Keāhole Airport with operations beginning at the new airport on July 1, 1970, with the new Queen Kaʻahumanu Highway built to that point. For three summers, I worked for Aloha Airlines, starting at the “Old” Kona Airport – initially throwing bags, then as a ramp agent greeting and saying farewell to the planes as they landed/departed. After the old airport’s closure, its runway was used as a drag strip until the State and the County converted it to a recreational park around 1976. The runway is used as a parking area and access road for the former State park area. In October 2010, the State completed the Kona International Airport at Keāhole Airport Master Plan which provides a long-range vision of the developments on airport property. Recently (March 2013,) an EIS preparation notice was filed for proposed airfield improvements and airport facilities related to that plan that are anticipated to be implemented within the next five to ten years. 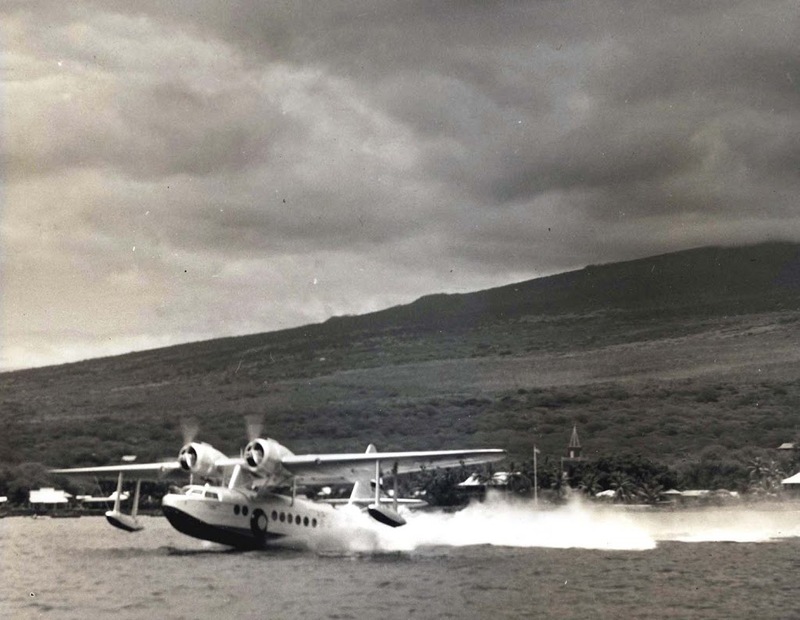 The image shows an Inter-Island Airways taking off from historic Kailua Bay (the early means of air travel in and out of Kailua-Kona.) In addition, I have added other images in a folder of like name in the Photos section on my Facebook and Google+ pages. The coming of Henry Obookiah (ʻŌpūkahaʻia) and other young Hawaiians to the continent had awakened a deep Christian sympathy in the churches and moved the American Board of Commissioners for Foreign Missions (ABCFM) to establish a mission in the Hawaiian Islands. Bingham and Thurston were ordained at Goshen, Ct on September 29, 1819; it was the first ordination of foreign missionaries in the State of Connecticut. There were seven American couples sent by the ABCFM to convert the Hawaiians to Christianity in this first company. These included two Ordained Preachers, Hiram Bingham and his wife Sybil and Asa Thurston and his wife Lucy; two Teachers, Mr. Samuel Whitney and his wife Mercy and Samuel Ruggles and his wife Mary; a Doctor, Thomas Holman and his wife Lucia; a Printer, Elisha Loomis and his wife Maria; and a Farmer, Daniel Chamberlain, his wife and five children. Although a large part of the motivation for the Hawaiʻi missionary movement, Henry ʻŌpūkahaʻia unfortunately died of typhus fever in 1818 and didn’t return home to teach the gospel. However, his book, “Memoirs of Henry Obookiah,” was the inspiration for this and subsequent Hawaiian missionary companies. After 164-days at sea, on April 4, 1820, the Thaddeus arrived and anchored at Kailua-Kona on the Island of Hawaiʻi. Hawai‘i’s “Plymouth Rock” is about where the Kailua pier is today. By the time the Pioneer Company arrived, Kamehameha I had died and the centuries-old kapu system had been abolished; through the actions of King Kamehameha II (Liholiho,) with encouragement by former Queens Kaʻahumanu and Keōpūolani (Liholiho’s mother,) the Hawaiian people had already dismantled their heiau and had rejected their religious beliefs. One of the first things Bingham and his fellow missionaries did was begin to learn the Hawaiian language and create an alphabet for a written format of the language. Their emphasis was on teaching and preaching. On July 14, 1826, the missionaries selected a 12-letter alphabet for the written Hawaiian language, using five vowels (a, e, i, o, and u) and seven consonants (h, k, l, m, n, p and w) in their “Report of the committee of health on the state of the Hawaiian language.” The report is signed by Hiram Bingham and Levi Chamberlain. The arrival of the first company of American missionaries in Hawaiʻi marked the beginning of Hawaiʻi’s phenomenal rise to literacy. The chiefs became proponents for education and edicts were enacted by the King and the council of chiefs to stimulate the people to reading and writing. Interestingly, these same early missionaries taught their lessons in Hawaiian, rather than English. In part, the mission did not want to create a separate caste and portion of the community as English-speaking Hawaiians. In later years, the instruction, ultimately, was in English. The Society operates the Hawaiian Mission Houses Historic Site and Archives, comprised of three historic houses and a research archives with reading room. The Society also compiles the genealogical records of the American Protestant missionaries in Hawai‘i and promotes the participation of missionary descendants in the Society’s activities. 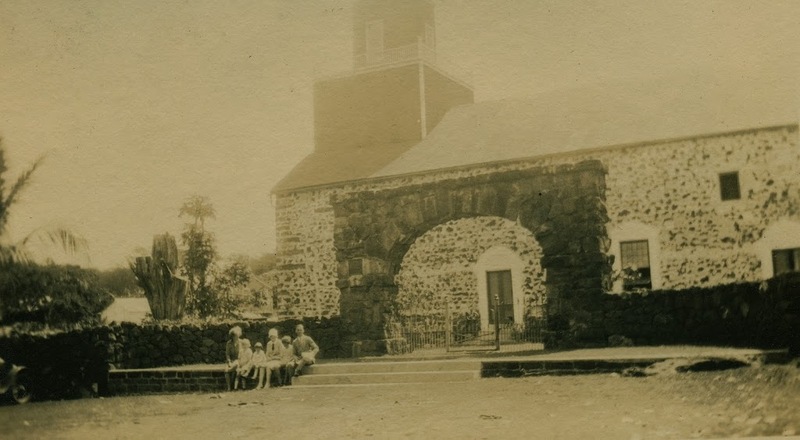 The image shows the early Mission house and Chapel in Honolulu (the precursor of today’s Kawaiahaʻo Church.) More images are added to a folder of like name in the Photos section on my Facebook and Google+ pages. This stone and mortar building, completed in 1837, is the oldest surviving Christian church in the state of Hawaiʻi, started by the first Protestant missionaries to land in Hawaiʻi. 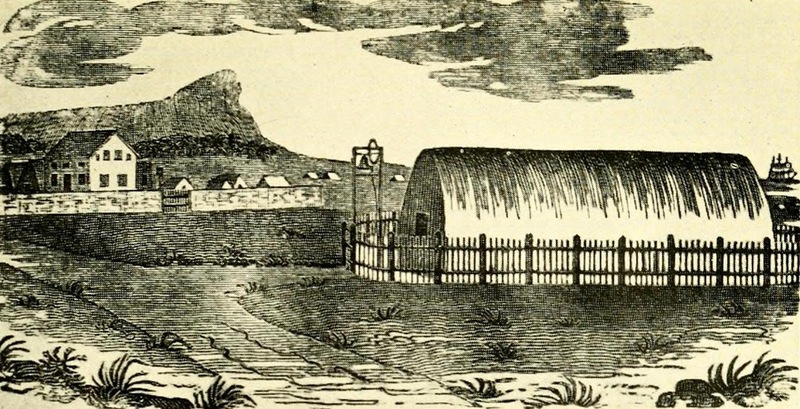 With the permission of Liholiho (Kamehameha II), the missionaries built a grass house for worship in 1823 and, later, a large thatched meeting house. Missionary Asa Thurston directed the construction of the present Mokuʻaikaua Church, then the largest building in Kailua-Kona. Its massive size indicates the large Hawaiian population living in or near Kailua at that time. Mokuʻaikaua, with its 112-foot-tall steeple, is a reminder of the enthusiasm and energy of the first American missionaries and their Hawaiian converts. Built of stones taken from a nearby heiau and lime made of burned coral, it represents the new western architecture of early 19th-century Hawaiʻi and became an example that other missionaries would imitate. The original thatch church which was built in 1823 but was destroyed by fire in 1835, the present structure was completed in 1837. Mokuʻaikaua takes its name from a forest area above Kailua from which timbers were cut and dragged by hand to construct the ceiling and interior. Mokuʻaikaua Church is centered in a small level lot near the center of Kailua. Its high steeple stands out conspicuously and has become a landmark from both land and sea. Huge corner stones, said to have been hewn by order of King ʻUmi in the 16th century for a heiau, were set in place and offers evidence of the heavy labor which contributed to the Church’s construction. The central core of the steeple is polygonal with alternating sections of wide and narrow clapboard. The wider sections are articulated with louvered arches. The 48 by 120 feet lava rock and coral mortared church is capped with a gable roof. Construction beams are made from ʻōhiʻa wood. Pieces of the wooden structure were joined with ʻōhiʻa pins. The spanning beams are fifty feet long and are made from ʻōhiʻa timbers. Corner stones were set in place 20 to 30 feet above the ground. Mokuʻaikaua Church is the first and one of the largest stone churches in Hawaiʻi, outstanding for its simple, well-proportioned mass and construction. In 1910, a memorial arch was erected at the entrance to the church grounds to commemorate the arrival of the first missionaries. Congregationalist missionaries from Boston crossed the Atlantic Ocean, rounded Cape Horn, aboard the Brig Thaddeus. A replica of the Thaddeus is in Mokuʻaikaua Church. On the morning of April 4, 1820, 163 days from Boston, the Congregational Protestant missionaries, led by Hiram Bingham, aboard the Thaddeus, came to anchor off the village of Kailua. Inspired by the dream of Hawaiian Henry ʻŌpūkahaʻia, seven couples were sent by the American Board of Commissioners for Foreign Missions to convert the Hawaiians to Christianity. Two Ordained Preachers Hiram Bingham and his wife Sybil and Asa Thurston and his wife Lucy; Two Teachers, Mr. Samuel Whitney and his wife Mercy and Samuel Ruggles and his wife Mary; A Doctor, Thomas Holman and his wife Lucia; A Printer, Elisha Loomis and his wife Maria; A Farmer, Daniel Chamberlain, his wife and five children. 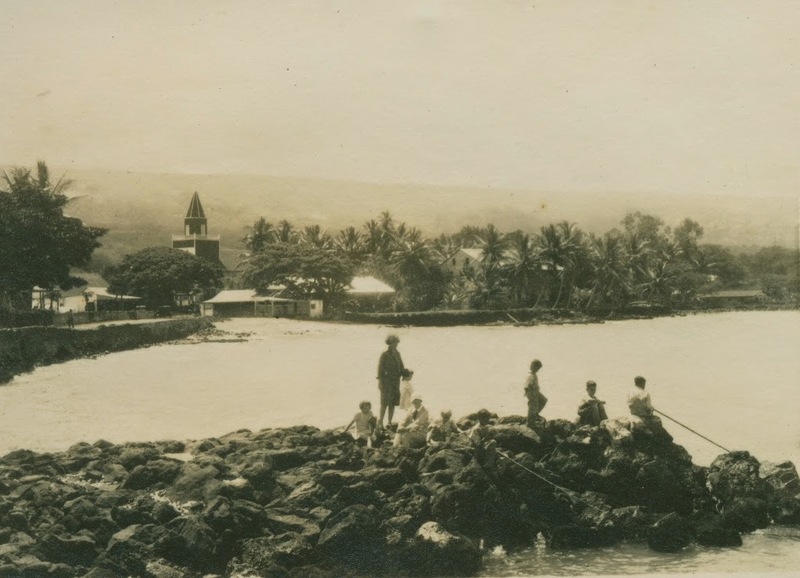 The Thurstons remained in Kailua, while their fellow missionaries went to establish stations on other Hawaiian islands. In addition to this, I have included other images of Mokuʻaikaua Church in a folder of like name in the Photos section on my Facebook and Google+ pages.